Heat oven to 425°F. In large bowl, mix peaches, sugar, tapioca, cornstarch, cinnamon and lemon juice. Let stand 15 minutes, stirring occasionally. Meanwhile, unroll 1 pie crust on work surface. Sprinkle both sides lightly with flour; place in ungreased 9-inch glass pie plate. 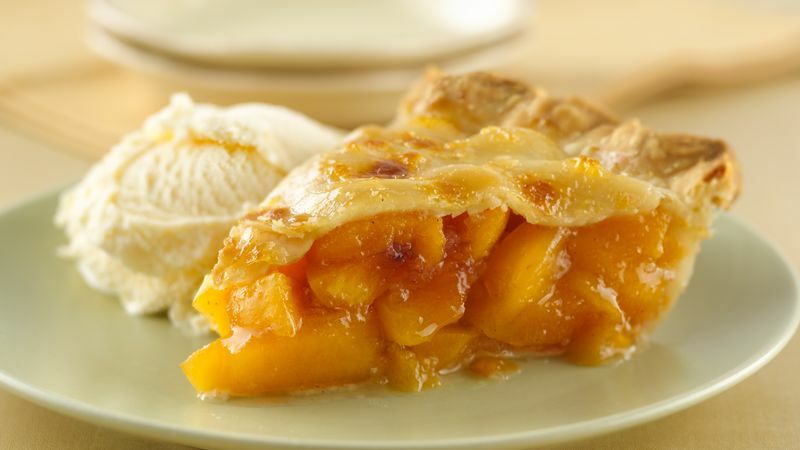 Spoon peach mixture into crust-lined plate. Press firmly against side and bottom. Top with second crust and flute; cut slits in several places. Cover crust edge with strips of foil to prevent excessive browning; bake 20 minutes. Remove foil; brush with preserves. Bake 20 to 30 minutes longer or until golden brown. Cool at least 2 hours before serving. Did you know? Pillsbury has a gluten free pie and pastry dough. Julie Gonzalez of Okeana, Ohio, won 1st Place with this recipe at the Pillsbury Refrigerated Pie Crust Pie Baking Championship, 2009 Ohio State Fair. If you'd rather, 1/8 tsp. nutmeg can be substituted for the cinnamon for a subtle nutty flavor.